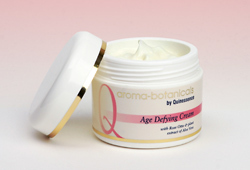 In the prestigious Natural Health and Beauty Awards 2008 held in March, Aroma-botanicals® Age Defying Cream has been voted the outright winner in the ‘Best Day Cream’ category. Quinessence had to fight off strong competition to pick up this exclusive accolade from the panel of beauty experts at Natural Health and Beauty Magazine, and their vote means that we have now been winners in these influential Awards for 4 years in succession. ‘An excellent value-for-money daily moisturiser. Light and delicately scented it combines extracts of organic English Lavender and Rose Otto oils, together with Shea Butter and Aloe Vera to help plump up the skin and protect against free radical damage’. She continued, ‘More and more of us are waking up to the fact that there is no comparison with a face cream manufactured by a corporate giant with cheap ingredients and industrial synthetics, to one that is prepared ethically and conscientiously from organic essential oils and natural plant extracts’. As a small specialist company upholding these ideals and standards for decades, we were absolutely delighted and honoured to be recognised by the panel at Natural Beauty magazine. After all, we were competing with an even larger number of high-street, well known brands than we had in previous years. We strive hard to ensure that all of the products in the Aroma-botanicals range are competitively priced to make it even easier for everyone to live a chemical-free lifestyle. There are no harmful ingredients, colours, fragrances or harsh preservatives to be found in the range. Instead it is all about natural, pure ingredients that care for your skin from head to toe. And because every product contains vitalising organic essential oils, beautifying plant botanicals and moisturising vegetable oils, you will experience a totally holistic aromatherapy treatment each time you use them. When used regularly, the advanced formula combining organic English Lavender and Rose Otto oils together with Shea Butter and Aloe Vera works to slow down the ageing process and improve micro-circulation.